I'm truly not putting this out there for attention or anything like that, however, I feel this is something that needs to be said...everyone has their opinion of what they'd do if they were ever in my shoes. But the reality is, if you've never lived it, you really DONT KNOW what'd you'd do! Being the spouse that is subject to constant abuse, may it be emotionally or physically, is a hard place to be in itself. Add the fact that you have kids together makes your choices that much harder! I hear it all the time, "if it were me, I'd have done this or I’d have done that!" But until you actually live it, you don't truly know what you'd do! I love my 4 absolutely beautiful, amazing kids with every fiber of my being, which is why over the past 14 years I made the choices that I made, because I THOUGHT it was what was right by them, not me, not my ex, but for my 4 kids! I THOUGHT growing up in a "2 parent" home was best for them. No matter what I had to deal with. I thought I could take the brunt of his anger to keep my kids well supplied and in a 2 parent home and keep my kids happy, no matter how miserable and sad and scared of him I was. I was truly afraid that I’d be dead if I ever really made that escape from my ex, leaving my 4 amazingly beautiful kids to be raised by him alone and then becoming the source of his anger, and for me, for several years, I was not willing to do that to my babies. They are my whole world, and I did not and do not want them to be the brunt of his anger because I finally had the courage to really get away from him! When I first married, my soon to be ex husband was great, and we were great and we were happy. But, when our first child was born in 2002 something changed. 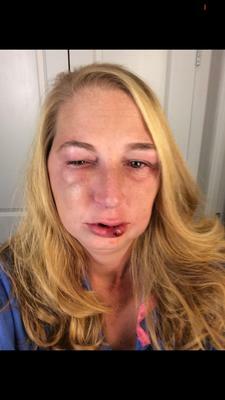 My husband became violent. Although it was rare in the early years, it would become closer and closer to each episode over the years. The latest two episodes being the most violent and potentially life threatening. The first, 3 weeks after having brain surgery and then attempting to back his lifted truck over me with his mistress in the vehicle. I used to love him, but I don't anymore. It took him hitting me with his truck in front my kids and my 8 year old daughter asking "mommy, is that how daddy's are supposed to treat their wife?" to truly open my eyes that this life is not the life that'd be best for them! The life best for them is their mother and father no longer together, but me alive, not fighting constantly!! Being in a emotionally and physically violent relationship can make a person do something completely opposite what is said to be right for the situation. I've always and continue to be the one to be blamed why life is so hard now for all of us, but that's ok. I'll take that blame knowing I'm alive and taking care of my amazing 4 kids with the help of my dad and step mom, with their dad getting exactly what he deserves!!! I have a restraining order against my ex with 5 violations (more that he violated that I was stupid enough to let go), and I have full custody of my kids, which I feel is justified! But as of today everything that's happened is mine and mine alone’s fault for happening! An abuser will never take responsibility for their actions. They always blame someone else for things being the way they are! Honestly, I'm tired of being blamed for things, I'm tired of being told "you should've done this or that"! Until you've lived it, you really don't know what that life is like! I've finally made that final break from my abusive ex of 14 years and life has been nothing but incredibly hard. Yet, it is completely worth it to not have to walk on eggshells to avoid an argument that could turn into physical violence in a matter of seconds!! I had to really make my mind up that I was willing to risk death in order to get away, not for my safety, but for my kids safety and stability and correct thought process of what a relationship between man and woman SHOULD be! No one deserves to be hit, especially over stupid stuff! No child deserves to see their parents physically violent! Home is where they should feel most content. But children as I've come to realize, are much smarter than we adults are at times…. Home life should be a happy and violence free life for children!!! I'm the reason my ex has nothing. I'm the reason I have nothing, and we are poor. I’m the reason my kids are sad. I’m the reason our lives were turned upside down and live scraping pennies. But at least I came out of it with my life, while too many lose their battles with domestic violence. One day, everything I've gone through will be worth it, completely worth it! If you're in an abusive relationship, it's not your fault, but you do have to make that final decision, but the way you do it has to be calculated to get out alive and safe!!! Domestic violence is not your fault, it's the abusers fault!!! Thanks to my abuser, he caused so much trauma to my brain that I now live a life of surgeries and pain for VP shunts and involuntary seizures. Yet, he to this day blames me for EVERYTHING! He hasn't even pulled any jail time yet for all this, but I'm hopeful one day he will get what he deserves too. At least I made it out alive. I'm still struggling daily as a single mom to 4 children, but I'm doing the best I can. I was you; and I'm with you! Ashley - I was you, so I understand. You are brave and strong and deserve happiness. You are correct; it is not possible for others to understand what we have endured unless they have been through it. But we get it! We survived it! I read the comments you made that sound like his words - that he blames you for the consequences of his behavior. Please please do not ever allow yourself to consider even for one second that any of his issues are caused by you! You are not to blame! I wish I could personally help you - it breaks my heart to see us struggle every day - with money, our children, places to live, jobs, our injuries and medical treatment, continued survival and safety fears. I just doesn't seem fair or that it will ever end. But I know this - we gotta hang in there - cause it will be better! The sun keeps shining, spring flowers bloom - and peace will be ours. Stay strong girl!!!!! You CAN keep going forward. You are alive and you can thrive!!!!! i am so sorry for what happened to you. i know exactly how you feel as i was in an abusive marriage for 34 years and had 7 children until i finally had enough. i got an order of protection in 2014 and since then he has continually broken the order, but police and judge do nothing. he has taken all assets, cars, trucks, motorcycle, trailer, tractor, race cars, motor home etc etc and stopped paying all the bills. we are living in poverty but it is 100% BETTER THAN HAVING HIM HERE. HE HAS $400 HR DIVORCE LAWYER AND I HAVE TO REPRESENT MYSELF. SOMEDAYS I FEEL I CANT GO ON, BUT KNOW I MUST FOR MY CHILDREN. I WANTED TO MAKE SURE THEY KNEW HIS BEHAVIOR WAS UNACCEPTABLE and to make sure they never treated anyone like he did.i hope things are going better for you and if you need to talk to someone you can contact me. Yes these are actual photos of me on 3 separate beatings. My ex always loved punching me in my face over and over. I would hide away for weeks or months at a time so no one would see me. It took 13 years to finally get to the point in at now with the support of a new amazing man that has stood behind me every step of the way to encourage me to talk a oh it so that I could truly begin to heal from the years of damage I endured. I'm learning to truly live happily again. Thank you for your comment and I truly hope you make the best choice for you, Good Luck! I'm so sorry. Are those actual pictures of you? If so, thank you. Thank you for having the courage. I still do not have your courage. I do feel you when you say, sometimes it's making a decision, "I could die getting out". It's the reality. I USED to be one of those that said, "Oh, no way in hell would I put up with that". And here I am. Until you're there, you simply don't know. We are in the "honeymoon" stage right now. He's on his best behavior. I know the venom is waiting. On eggshells! God bless you.